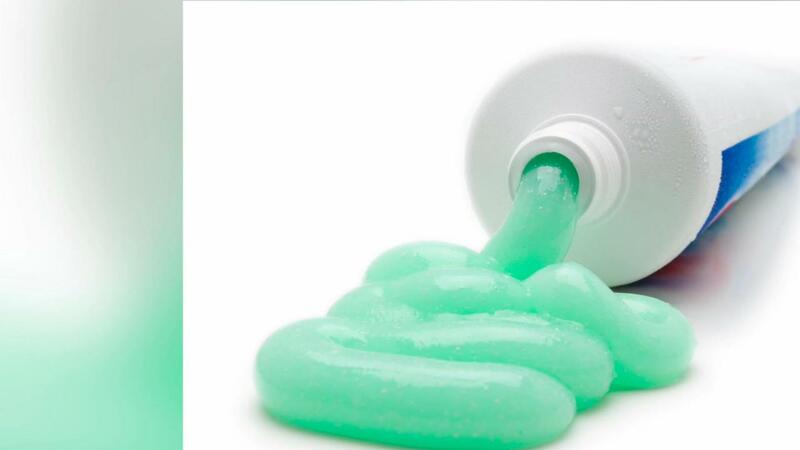 Apparently, we need to be putting toothpaste on more things than just our toothbrushes. The minty and magical substance usually reserved for our choppers happens to have a plethora of other benefits. Some are crazy weird, some are pretty logical, but it seems that toothpaste has some hidden uses we've got to try! Scuffs, scratches, dirt, be gone! Just make sure your paste is non-gel, and give those sneaks or leather shoes a lil scrub. Diamonds, silver. It's all the same, and your toothpaste can be used to make it look spankin' new. 3. Prevent your mirror from fogging. Scrub on, wipe off. Just make sure it's non gel. Toothpaste helps dry those pimples out - just blob some on before you head to bed for the night. You'll be amazed how quickly it disappears! Works with makeup, even the reddest of lipstick. Scrub some on the site of the stain. Just be wary if it's a whitening toothpaste on colored clothing! Your kid thought he was the new Picasso, but not for long! You don't even need to repaint if you scrub hard enough. Toothpaste will help strengthen the enamel and gets rid of those callouses. You won't forget the coaster next time, but for the meanwhile, toothpaste helps get rid of those ugly stains. Toothpaste is the best way to get rid of the sour smelling aroma in your baby's cup. Just make your own minty solution. Toothpaste, you da real MVP.